Was walking back to my truck after work today, and nearly stepped on this little bugger (which really isn’t so little) in the middle of the parking lot. 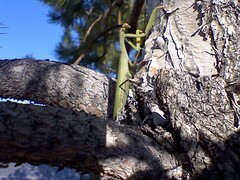 Scooped it up, carried it over to a tree, and let it loose, watching it climb up up and away. An amazing sight, and completely unexpected.